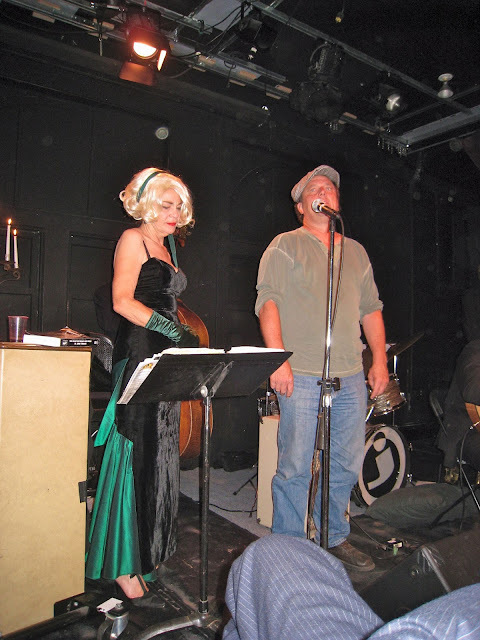 Suzy Williams and her excellent band ("The Cracked Binding Quintette") brought back the ever-popular Lit Show to Beyond Baroque, and a blast was had by all. This unique - and educational - show is great because it's all songs by famous authors that you may not have known also dabbled in songwriting. Writers like Dorothy Parker and Langston Hughes. John Steinbeck and F. Scott Fitzgerald. Even "Willie The Shake," as Suzy calls Shakespeare. Gerry Fialka introduced his darling wife Suzy, dressed to the nines in an evening gown and platinum blonde wig to open the show. She greeted the packed house with "Hello, Gentle Readers!" and then we all sang along to the show's theme, "The Liiiiiiiiiiit Show." Then we were off and transported to the future (via Ray Bradbury), the Dustbowl (via Steinbeck), Ireland (James Joyce) and even the Monte Carlo Moon (courtesy of Fitzgerald). As great as all of the songs are, so are Williams' asides ... "John Thomas, who took a vow of poetry, I mean poverty, (shrug) ... Same thing." Draping herself across Brad Kay's piano, sultry Suzy said, "I'm Lucy and you're Shroeder, Boss." Or in acting out Tom Joad's speech with actor Sam Clay, Williams said, "Steinbeck is my MAN. He's all about spirituality and socialism, my two favorite things!" I love Suzy Williams. Especially because she dedicated that number to myself and Greta Cobar, and we were delighted. I think my favorite line of the evening was when Suzy sang about Lawrence Ferlinghetti and his dog, "He doesn't hate the Police, he just has no use for them." Yep. Singing Fitzgerald's "Fie! Fie! Fifi! ", Williams began by saying, "This is 17 year old Fitz, but he's already bitter, partying and loving the Riviera." When we sang along to Tim Finnegan's Wake, a real rouser, Williams said, "You pretty much wanna brawl with someone when you sing that song." You kinda do, and we're peaceniks. Oh, the power of music! It is powerful, indeed. From brawling to tearing up in no time flat, like I did when Williams sang the beautiful "A Song Of Love" by Lewis Carroll. I admire Suzy so much, because she is a true performer, who throws every inch of her tiny frame into every word and note. You FEEL the songs. The crowd stood and cheered for Suzy and her talented gentlemen (Brad Kay, Danny Moynahan, Marcus Gerakos, Peter Marshall and Don Allen), and ran home to mark calenders for next year's Lit Show. Thank yous to all involved in this year's smash ... What a fantastic night in Venice!